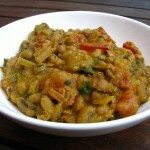 Metin Shuro is an Ethiopian food recipe of spiced beans and vegetables to be used as flavoring in stews and meals. Blanch all legumes in boiling water for a few minutes. Drain. Parch the legumes separately in an oven, then dry in sunlight in a dry breeze for two days (or, if you have a convection oven, leave the door open a crack and keep on lowest heat) until thoroughly parched. When thoroughly dry, grind separately, then mix flours together. Mix red pepper, ginger, garlic, red shallots, rue, and savory, and dry outside in the sun, or use dry equivalents. Mix legume flours with salt, dried herbs, and spices. Process the whole mixture in a food processor until finely ground. May be kept indefinitely in a dry place in a sealed jar. 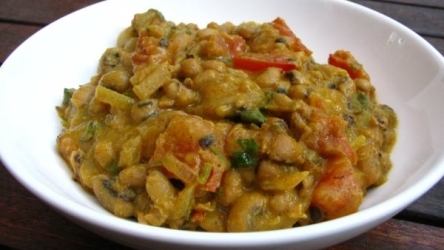 Mix with vegetables or stew.